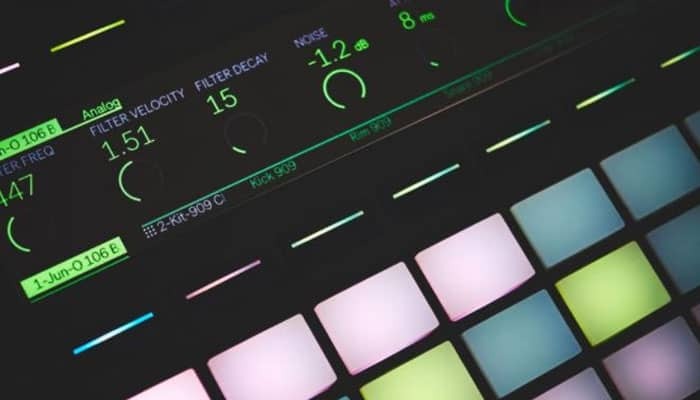 Today we are having a nose at a selection of what we feel are top contenders for the 8 best drum kits of 2019. Seasoned drummers probably have a dream kit in their minds, and we would be willing to bet it results in a combination of brand names. How to set up a Drum Kit? What to look for in a Drum Kit? 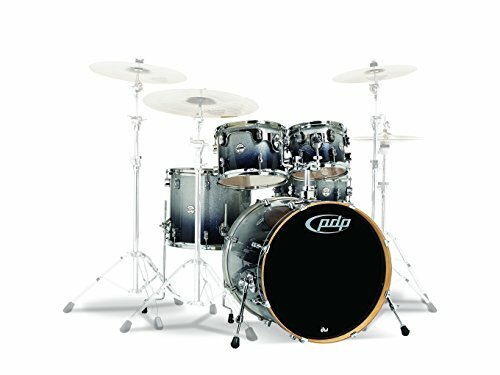 Best Drum Set under $1000? So with this in mind, we are taking a closer inspection to see what each kit comprises of and, really offers up. We have used a lot of criteria to judge this one, as a drum kit is ultimately a percussive array with individual parts and the quality of each piece needs comparing. Most of the cymbals in these sets may not wow but that is to be expected, usually those who manufacture great sounding drums struggle with their crashing comrades in comparison. Need to practice silently? Try an electronic drum set instead. Full kit inclusive of stands, throne and sticks. Whole kit with all the necessary accessories. Well built and easy to set-up. First up is a fantastic 5-piece from pearl, it is a full basic kit and available in 4 gig ready set-ups with a selection of 4 different durable wrapped finishes. The bass drum, toms, and snare are all made from 9-ply poplar with triple flanged hoops. The drum dimensions are as follows 22 x 16” (bass), 1 x 8” & 12 x 9” toms, 16 x 16” floor tom and a 14 x 5.5” snare. 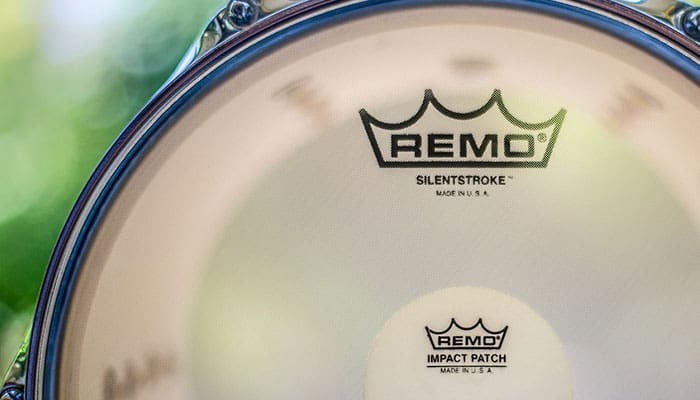 The snare and rack toms are pre-tuned so you will only have to fiddle with the bass and floor tom. All stands, bass pedal throne, and tom holders are included. 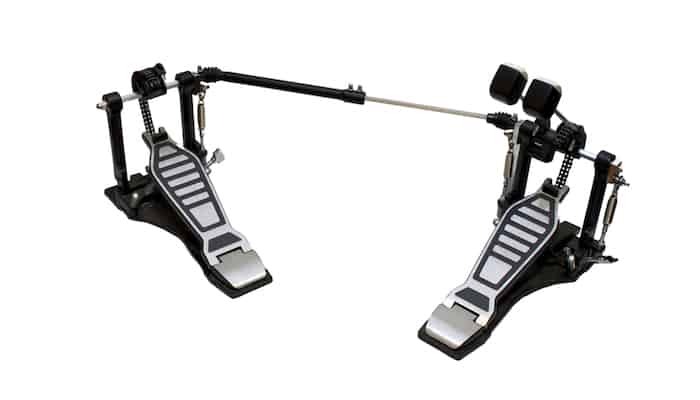 Despite its affordable price tag it features some professional upgraded parts, such as a chain drive bass drum pedal and geared locking stands, which are reinforced, and double braced for longevity. The 14” hybrid hi-hat cymbals are crisp, some people haven't been wowed by the 16” crash cymbal, in fact, this kit is on the quieter side which makes it ideal for those who have to be conscious of their neighbors. The throne is probably suited to pre-teens, if we have to poke holes in anything, it would be the initial upgrade. The whole kit, in general, has a slightly smaller footprint making it ideal for apartments and for younger learners. + Full kit inclusive of stands, throne and sticks. Why We Liked It - Pearl are one of the top ten drum manufacturers worldwide, the cymbals aren't too impressive, but let's face it the most common thing to replace or add are to are your cymbals, really great ones will often set you back a few bob. 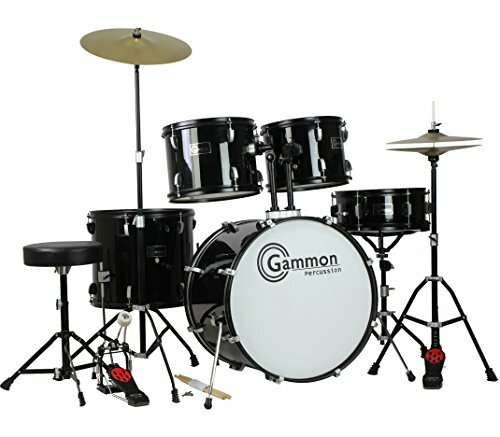 Another option we took a look a look at was this fab full-size adult drum kit from Gammon. It is a very low-priced option but once again comes with everything you need to set up easily straight out of the box. The drums are all made from real wood, the Lug bass drum is 22 x 14” and comes with a chain driven pedal. It has a 5.5 x 14” snare, and the floor tom is 16 x 16” . The rack toms are mounted with adjustable tilt memory locks and are 12 x 10” and 13 x 10”. In all honesty, the cymbals are once again where this kit fails to satisfy, but it does make for a valuable student model. The hi-hats are 12” and the crash/ride is 14” in diameter and as we said to leave a lot to be desired for a tame ear. + Whole kit with all the necessary accessories. + Well built and easy to set-up. Why We Liked It - It is a good quality starter set, has an appealing price tag providing more bang for your bucks, quite literally! Next on our list is a new and improved full size model of the EXX705/c which, if the budget allows makes for another top choice from Pearls Export series. It is unsurprising to see another entry with their name on given their standing within the drum manufacturing industry. It is a step up in price, we lose the additional cymbals, so we would have to source our own but in terms of product quality and drum sound, the upgrade is huge. The shells are a 6-ply poplar and mahogany mix, which provides a louder resonance as well as being stronger. The quality of the covered wrap is an improvement too. The hardware included is from their popular 830 series. It features an advanced Opti-Loc Tom suspension system. 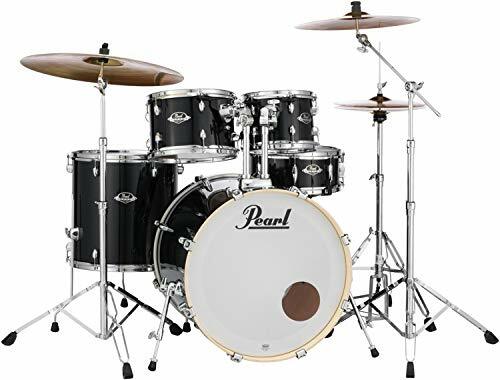 In direct comparison to the starter Pearl reviewed above, it has a 2 inches bigger bass drum and floor tom size (22 x 18” and 16 x 16”) and incorporates Pearls superior shell technology (S.S.T). It also comes with an upgraded pedal, the highly popular P930 Demonator. Why We Liked It - It is a leap rather than a step up in our eyes from their initial entry level kit, the price increase is not huge which makes it an ideal upgrade to your typical beginners kit. Now for a brief cheeky glimpse at the other end of the price spectrum, around 7-8 times the price of our lowest priced set, to see what your money can get you this year. This eye-catching hand-painted, lacquered finish mango sunburst kit from the Mapex Saturn series features stunning Delmar covered thin walnut and maple shells, that gives a rich depth to the toms and bass. The snare is lug walnut and maple to match. All of the toms are mounted beneficially with double braced Mapex I.T.S suspension mounts and are seriously great at picking up on nuances and dynamics. Their respective sizes are bass 22”, floor tom 16”, snare 14”, and the mounted toms are 10” and 12”. The drum heads are Remo Emperor batters, which allow for easy tuning and a fattened overall sound, they actually sound like they ought to be a shell size larger than they are. Once again we don't get any cymbals thrown in but this is typical as many top drum manufacturers stick to what they are good at which is drums. Why We Liked It - The bass is seriously isolated, the lug are single point contact and it has outstanding resonance and presence. It is exceptionally made and has higher-end features. 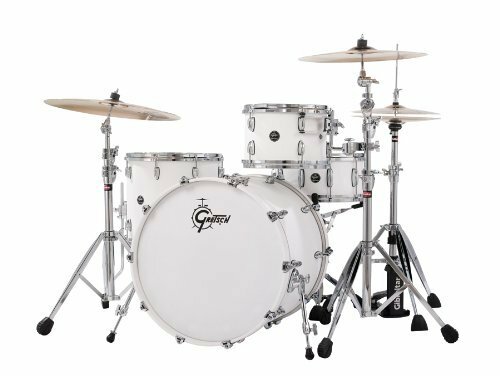 Hot off of the new Gretsch Renown series, is this fresh-faced three or four-piece kit, preserving the classic Gretsch vibe but with an updated aesthetics and sound enhancing customization. In true Gretsch perfection, they feature a maple mix, pairing Northern American Maple with a softer southern growing kind. Drum edges have a smooth 30-degree finish and are sealed with their exclusive silver sealer interior finish. Just about everything on this kit is heavy-duty, from its die-cast hoops to the authentic lugs that adorn each drum. The 4-piece consists of a 22 x 18” bass drum, 16 x 14” floor tom, one 10 x 7” tom, and one 12 x 8” tom. They are far more costly than a typical entry level kit and you are going to need to add a snare and at least a pair of cymbals before you can crank out a few tunes but they make for an impressive set of drums. + Gretsch maple mix formula. + Rich with great low end timbres. Why We Liked It - The sound is explosive, they tune well and come in several stunning finishes Blue metal, Satin Black, Silver oyster, or this delicious cherry burst. This stylish black glitter Breakbeats kit is again a 4-piece model, designed for city use, it has a more compact nature to keep it fit for purpose. It plays like a full-size kit but is stackable and packable, ideal for drummers on the move with its well thought out portability. It has a 14 x 16” bass drum, one 7 x 10” mounted tom and one 13 x 13” floor tom and is topped off with a matching wood snare drum, which measures 5 x 14”. All shells are constructed from a 7-ply hardwood, each bearing edge is cut at a 45-degree angle and hand-sanded for a perfect head seating. Ludwig has priced this one competitive it comes in just below the Pearl RS525SCC706. 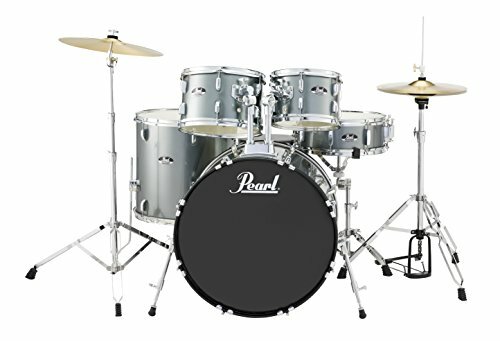 It doesn't have a snare stand, stool, pedal, sticks, or cymbals like the Pearl so will set you back a little more at the end of the day, but it is a good quality affordable choice. + 7-ply is professionally preferred. Why We Liked It - We love how portable this one is it would be an ideal kit for a street musician. If you are the sort of budding drummer who is looking for a bigger kit to let unleash your inner animal on, then this 8-piece shell kit from the PDP line by DW might be more up your street. The setup features, 2 bass drums measuring 22 x 18”, 2-floor toms (14 x 12” and 16 x 14”), 3 toms to mount (8 x 7”,10 x 8” and 12 x 9” as well as a 14 x 5.5” snare. They are suspended in highly durable steel mounts and are crafted from poplar which is a great tonewood for sustain and punch. They have Remo heads, their edges are cut at a 45-degree angle and look great with their stylish black lugs and hoops. As it is only a shell pack you only get the drums and the bass mounts for the mounted toms all of the other hardware and cymbals pictured will be additional purchases. To put it together as pictured you will need a rack, Tam and Gibraltar make great curved double bass racks that are similar in style. 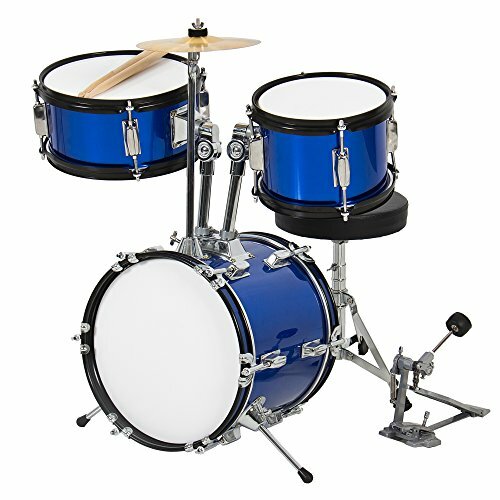 Why We Liked It - We like that the kit features 2 separate bass drums, for traditional and authentic double bass playing. We are finishing today's drum kit reviews with an inexpensive children's option. This little 3- piece makes a great choice for kindling an interest in junior learners. We stress it is not a toy model but in fact an inexpensive remodeling of a compact kit. The drums are real wood rather than plastic which we often disappointingly find on children's drum sets, they have chrome plated hardware. It has 1 cymbal and comes with drumsticks and a cushioned stool. 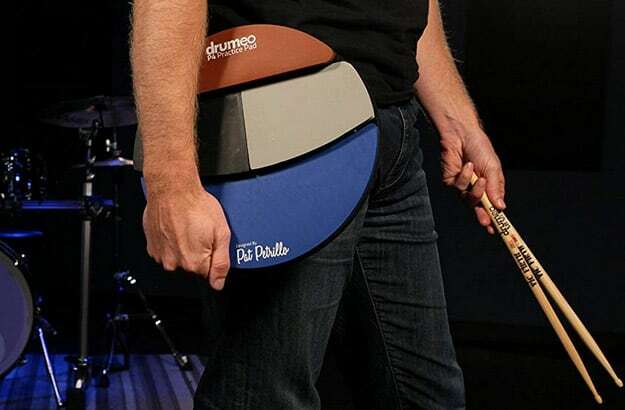 The kit is available in 3 different colors and makes the perfect gift for a budding percussionist. It is lightweight and premium quality for a junior product with a low price tag, its recommended age is 3 up and it is ASTM certified. Why We Liked It -Why We Liked It - Junior models should always be inexpensive to ensure accessibility to music learning regardless of circumstances. This makes a great drum kit for kids who want to emulate their drumming heroes on something that genuinely looks feels and sounds like the real deal. 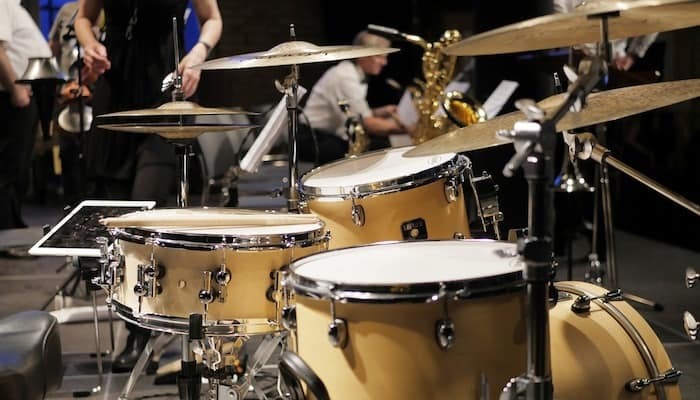 A drum kit essentially is a collection of drums and cymbals arranged in a manner so that each is easily accessible at all times, no matter which drum you are currently playing. They are set up on stands of rack mounts. A typical basic drum kit setup consists of a large bass drum which sits on its side and is beaten by a foot-operated pedal. A snare which incorporates stiff tort wires stretched beneath its skin, they can be beaten with a stick for a staccato sound or played with a brush. A snare drum is often the central piece of any drum kit it is a very versatile drum that can produce a variety of very different sounds. This is because of its extreme sensitivity wires that sit below the skin, which respond to any vibration no matter how soft. You can play the rims or skins to explore its dynamic range. 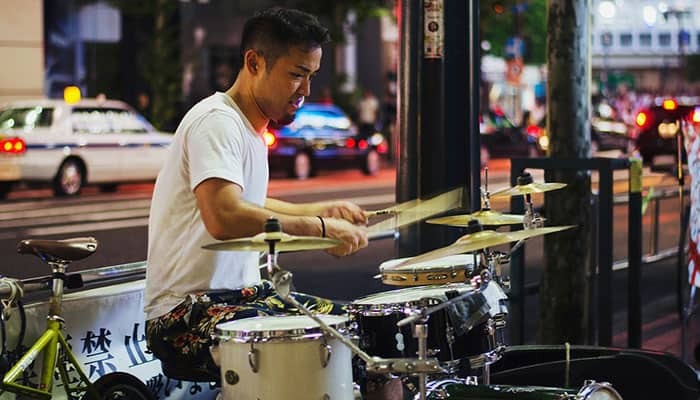 A hi-hat cymbal is usually a given also, it is composed of two equally-sized symbols mounted on an upright rod which open and close via a foot pedal. This produces sound itself but coupled with stick playing you can achieve a dampened strike or one that rings. Playing with the Dynamics and how hard you hit it opened versus closed allows for rhythmic creativity. 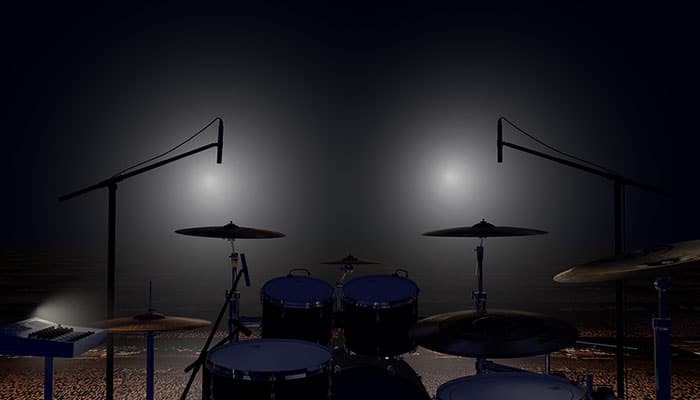 A drum kit will generally have a floor tom that sits within its own stand independently like the snare as well as one or more atoms which mounted to the bass drum itself. Other cymbals people tend to want to include a suspended ride or crash cymbal. Sometimes other percussion is added, for example, cowbells, woodblocks, and even chimes and sometimes double bass pedals which we have reviewed previously here. Each drum kit will differ only slightly to another in terms of set-up. Luckily when you buy a kit option they generally come with straightforward instructions for their assembly. Regardless of the configuration, the process is more or less the same. You will probably have to seat your own drum heads onto the shells and tighten the lugs, some toms will come already constructed and fairly accurately pre-tuned, typically the bass and floor tom will need a little adjusting to get an optimal tone. This is simple to do, tightening with a key, some of the kits we reviewed come with one included. 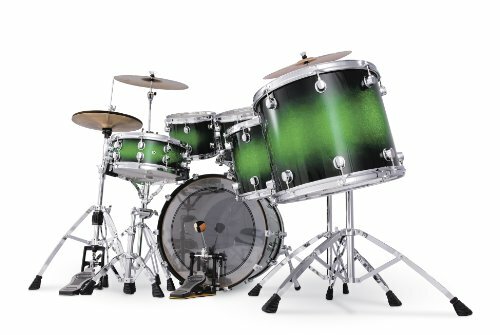 There are lots of instructional videos on YouTube to help with drum kit set-up if you are unsure, like this great one from Authentic.com on how to unpack, tune, construct an angle a Pearl Export series kit. This is a very open ended question but a decent affordable adult full-size kit will probably cost you somewhere between $500 and $1,500 but as you will have seen from our reviews quite often you will find you need to add to a kit or improve or upgrade certain aspects to your taste. Buying a kit is a great way to start off as you can typically customize and upgrade your mounts. What you are looking for is a good core for your set-up. Ideally, you want a bass drum snare and hi-hat, minimum, any toms and other cymbals are pretty much an added bonus if they come with the kit, to begin with. Some drum kits will be shell-kits consisting of just the drum shells, occasionally without any heads, this option is good for someone adding or transforming a kit and better left to those who know what they are doing. They require a bit of knowledge in terms of what stands and the hardware you are going to need. If you are a beginner we would recommend a good value 5-piece kit that comes with the full works pedals, keys, throne, sticks. So you know you have all the required part to put together and thrash. The cheapest kit we reviewed today was the 3-piece from Best Choice Products, however, it is only the best cheap drum kit for junior drummers. If you are looking for something for younger, smaller players it is a great quality option with its all wood drums compact size and choice of colors to boot. If you a fully fledged adult, then our top contender for best cheap is tied between the Pearl RS525SCC706 and the Ludwig LC179X016 Breakbeats. 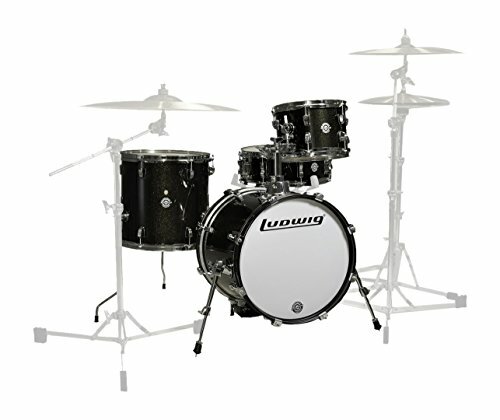 The Ludwig carries a smaller cost but it is only a 4-piece and comes with bass, snare, floor tom, and one mounted tom. You will also need to buy accessories separately. We believe the Pearl could be the best cheap option overall given the fact it doesn't include a hi-hat which is essential for most playing styles and that it will ultimately end up costing as much or possibly more than the Pearl in the end. It is a well constructed affordable 5-piece option which comes with everything you need to assemble and play from the get-go. 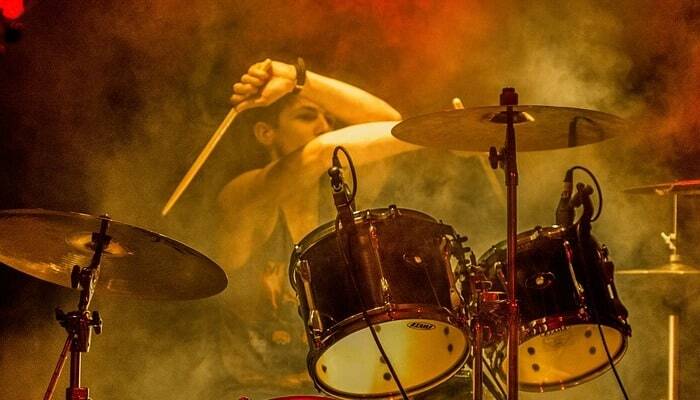 Pearl is renowned for making great drums. The cymbals on the set are a little lack-luster and would benefit from an immediate upgrade. Great cymbals are made by companies that exclusively manufacture cymbals and there is pretty much, no getting around it, so it is to be expected of most kits. For the best Under $1000 from today's reviews, our favorite is the Pearl EXX725S/E the fusion series on a whole is pretty impressive. It is quality 5-piece kit and a great step-up in terms of its 830 series hardware upgrade. They incorporate a delightful blend of premium tonewood (Superior Shell Technology S.S.T ) for optimal lows making it far louder and more resonant than a kit with equally sized head dimensions. The snare is highly responsive, allowing for expressive playing and it comes with a P930 Demonator pedal, which is a fully adjustable, non-slip, single driven chain pedal which features a Powershifter long-board. It has an interchangeable cam and benefits from their click-lock technology. You will have to shop around for cymbals to add to this one but it sits way below the $1000 mark, to begin with. 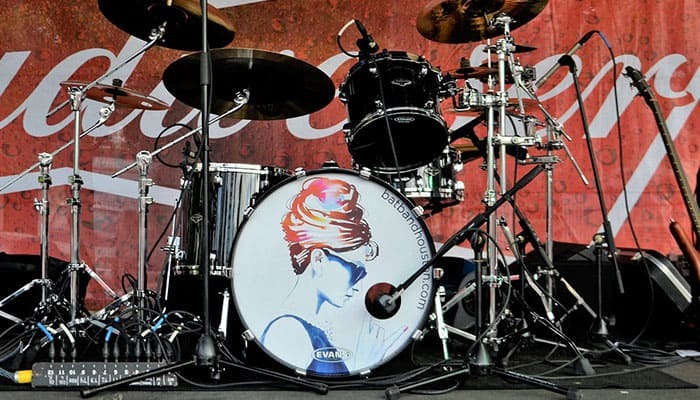 For quality we vote the Gretsch kit, it comes in over the $1000 mark but we feel it is worth every penny and not quite as frivolous a purchase as the Mapex, which is another top quality kit. It is safe to say a drum kit is a rather large purchase, this often equates to an emptier wallet. 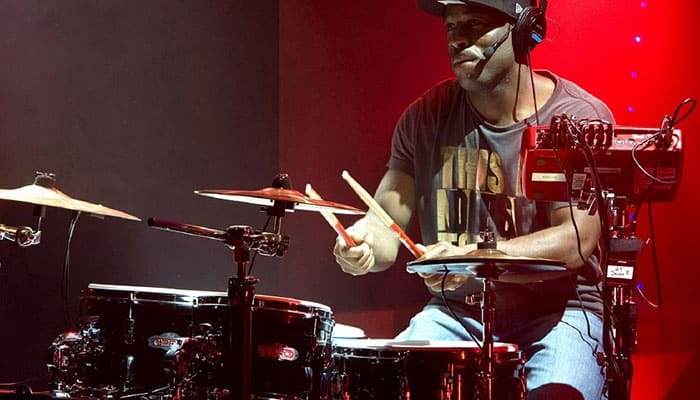 When shopping for a drum kit in essence you are shopping for multiple instruments at once as well as a way to tie them all together, sit at it, and the tools to tune it and play it. To get all of these key components satisfactory is no mean feat. The majority of less expensive options will not be of the greatest quality but given the fact that the majority of drummers upgrade as they progress and develop playing style and configuration preference an affordable kit is a good way to go for anyone starting out. Opting to go with a trusted brand is advisable when parting with a large amount of cash. Larger companies can streamline their product costs to give them the wiggle room to include some of the more advanced elements from their higher end products. We have looked at a good range of what is available with our selection today we hope our buyers' guide will have answered any queries you might have had. Drumming is often a very personal experience, many feel like their instruments are actually an extension of their arm and legs. It is therefore very important to have a pedal that responds in the way you want. There are 3 main ways a pedal is driven and achieve a different feel and resistance so you may want to replace your stock pedal when you purchase a complete kit. You can expand upon a drum-kit pretty freely, some drummers have very set-ups. Neil Peart from Rush famously uses a very large array ranging from 30-40+ percussive items set in an impressive, 360 degree arrangement.